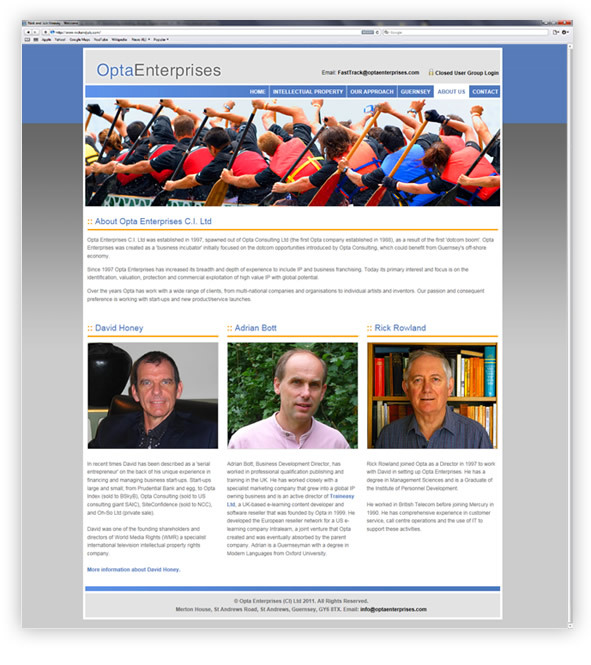 Click here to view the Opta Enterprises Website. Client Feedback: David Honey, Opta Enterprises. Guernsey. 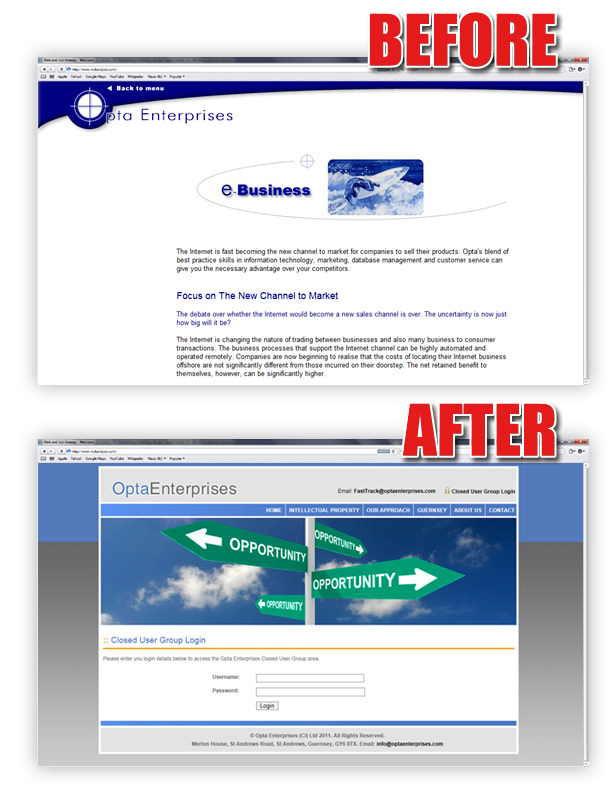 The complete redesign of the Opta Enterprises website uses bold imagery in addition to a new simple, elegant layout. Text is split into easy to read columns and the use of colour, both in the photography and site elements, make for a much more attractive website. The new site also makes use of a PHP/MySQL login and closed user group area. In addition to making the text easier to read by splitting it into columns and adding bullet points, the copy was completely re-written to make it clearer for humans and search engines to process. The removal of the previous sites ‘frames’ construction makes it much easier for search engines to index its content and brings the site into the 21st Century. All other areas of the site were built from the ground up ensuring that best practice search engine optimisation techniques were used. Opta Enterprises is a Guernsey based business incubator specialising in the identification, valuation, protection and commercial exploitation of Intellectual Property. When I was asked to update the logo, there were several guidelines that I need to follow – namely colour and the type of font used. 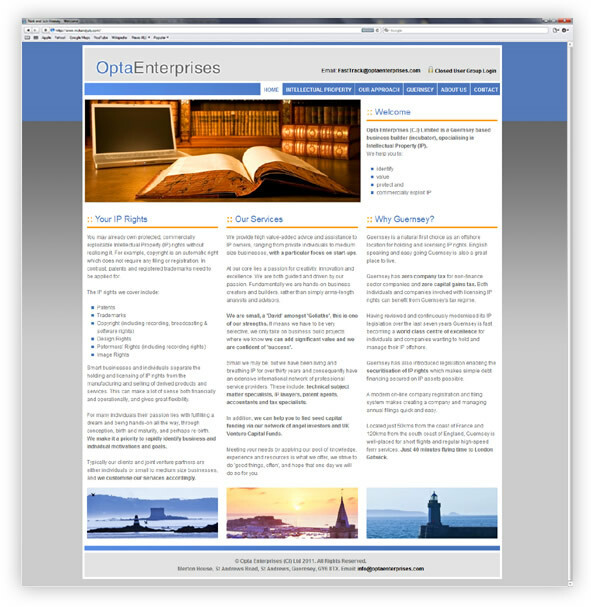 My solution was a simple, elegant logo which provides a modern feel to the Opta Enterprises website.